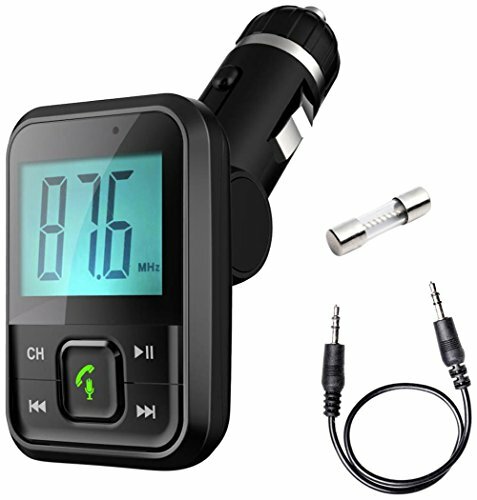 Pyle’s FM Transmitter is Bluetooth compatible that can be used with any Bluetooth enabled device like iPhone, android smartphones, iPads and others. This adapter offers wireless hands free calling for safe driving. It also has a digital LCD display to show channels. FM RADIO TRANSMITTER: An FM transmitter adapter that draws power through the car power socket. It transmits music and can also play radio stations with 206 channel options. 2.1 BLUETOOTH CONNECTIVITY: Comes with a built-in 2.1 Bluetooth for wireless music streaming. Compatible with Bluetooth devices like iPhone, android smartphones, iPad, tablets and more. The wireless range is up to 11 feet. DIGITAL LCD DISPLAY: Made with digital LCD display to show radio channels and simple button controls. Offers easy manual control to play, pause, forward music, answer calls and more. MEDIA FILE SUPPORT: Supports several media files with its USB flash drive port and micro SD card reader. This supports a maximum memory of upto 32 GB. HANDS FREE CALLING: This Bluetooth wireless streaming receiver is also a car charger that has an automatic switch for hands-free calling mode. Transmits calls through vehicle's speaker for drivers to take incoming calls while driving safely.